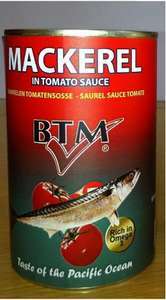 hot but arent mackerel tins around 70 odd p anyway at Home Bargains / B&M ? These look very cheap when compared to the small tins in ASDA. hot but arent mackerel tins around 70 odd p anyway at Home Bargains / B&M … hot but arent mackerel tins around 70 odd p anyway at Home Bargains / B&M ? not for 425g tins, you are thinking of the smaller flat tins. offer (star buy) is still on and I have seen it in Preston and Accrington too. Deal posting newbie! This is cjabingham first deal post. Help out by leaving a posting tip or just to show your appreciation for their contribution.